on February 11, 2019, 5:32 p.m.
Singaporean low-cost airline Scoot has had a difficult few months, with a succession of delays making headlines for the brand for all the wrong reasons. Indeed, YouGov BrandIndex data shows that it has experienced a large amount of turbulence among Singaporean consumers recently. Its Recommend score – which measures whether someone would recommend or tell others to avoid the brand – has fallen from +18.3 in October to +2.7 now. The brand’s unfortunate run began on 2 October 2018 when it suffered a hoax bomb scare, although this did not negatively affect Singaporeans’ recommendation of the brand. A month later, on 9 November 2018, a Scoot flight bound for Berlin was delayed for 10 hours, grounding passengers at Changi Airport. Again, this did not appear to impact its Recommend score. The same month, on 25 November 2018, a flight bound for Bangkok was delayed for 7 hours. Despite these long delays happening within a month of each other, Scoot’s Recommend scores remained constant. However, Scoot’s scores took a turn for the worse on 20 December 2018 following an incident where stuck in Athens for 56 hours. The delayed flight was heavily criticised in the media, which citied poor communication between Scoot and the affected passengers. On the day of the delay, Scoot’s Recommend score stood at a relatively healthy score of +15.7. A week after, it had dropped to +10.9. Ten days after the Athens delay, the brand’s passengers again found themselves grounded. A flight from Taipei was delayed for two days, affecting their New Year’s plans. The delay was well-documented by the press and on social media, and Scoot’s Recommend score subsequently dropped further – falling from +11.4 to +6.1 within a week. Since then, Singaporean consumers have been more likely to tell people to avoid the brand, sending its Recommend score further downward. 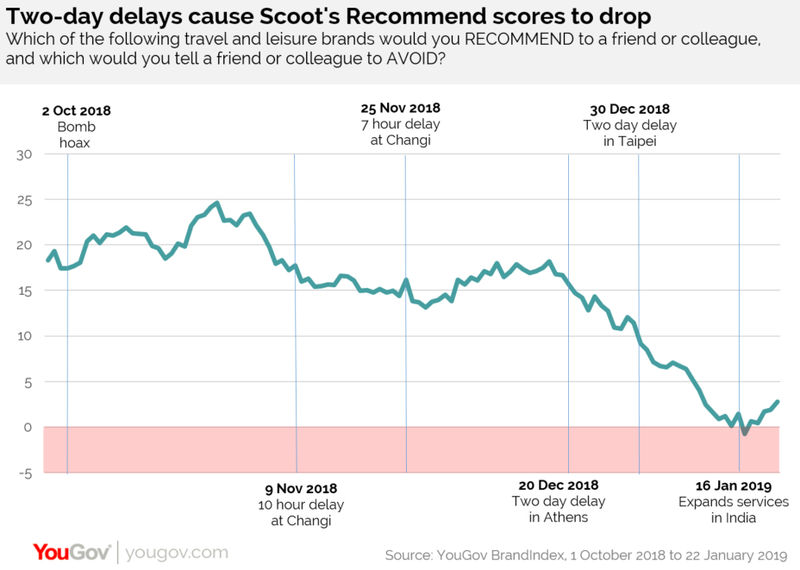 On 14 January 2019, Scoot’s Recommend score hit zero – meaning an equal amount of people have been recommending the brand and telling people to avoid it. Scoot has since taken some steps to improve consumer experience. On 16 January 2019, announcing expansion of its routes to India, causing its Score to move upwards slightly. Scoot has had a difficult time over the past three months. In that short time frame, its score has dropped almost 20 points due to major flight delays and inconveniences to its passengers. It will be interesting to monitor the brand, and see if or how it will manage to re-capture Singaporean consumer’s recommendations.